Lynn and Dov Silverberg upon the birth of their grand-daughter, Chana Shaina Silverberg, born to their Children, Gabrielle and Avi Silverberg. 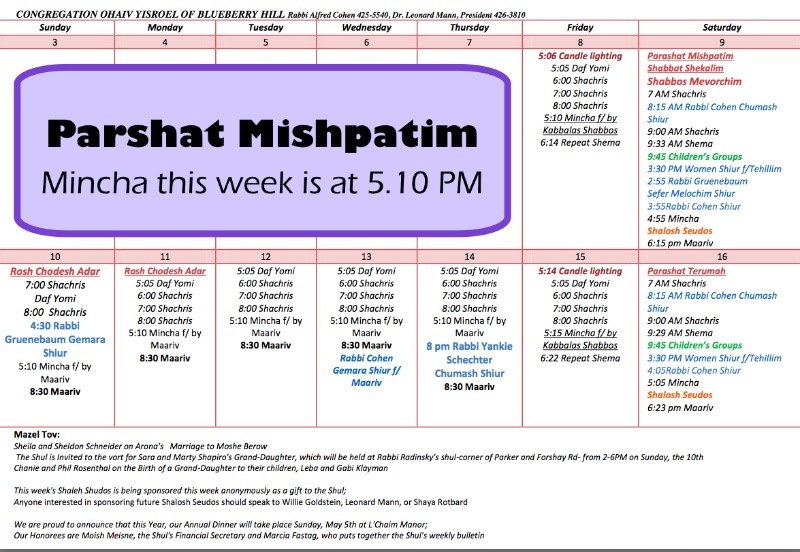 This week's Shaleh Shudos is being sponsored this week by: Kathy and Stu Perles to commemorate the Yahrtzheit of Stu's father, Ada and Jimmy Katz to commemorate the Yahrtzheit’s of Ada's father, Jimmy's father and Jimmy's grandmother. We are proud to announce that this Year, our Annual Dinner will take place Sunday, May 5th at L'Chaim Manor, Our Honorees are Moishe Meisner, the Shul's Financial Secretary and Marcia Fastag, who puts together the Shul's weekly bulletin. Miriam and Rabbi Cohen upon the engagement of their grand-daughter, Chani Lebenstein to Baruch Anermer. Hildy and AJ Straus upon Mordy's marriage to Malkie Berrger this coming Monday. Chani and Phil Rosenthal upon the birth of their grand-daughter, Naomi. We regret to inform you of the passing of David Adler, father of Amy Katzman. Amy will be sitting Shiva at her home at 18 Crestview Terrace until Friday afternoon, February 15th. May she and her family be comforted among the mourners of Zion and Yerushalayim. Our Honorees are Moish Meisner, the Shul's Financial Secretary and Marcia Fastag, who puts together the Shul's weekly bulletin. Sheila and Sheldon Schneider on Arona's Marriage to Moshe Berow. The Shul is Invited to the vort for Sara and Marty Shapiro's grand-daughter, which will be held at Rabbi Radinsky's Shul - corner of Parker and Forshay Rd- from 2-6PM on Sunday, the 10th. Chanie and Phil Rosenthal on the Birth of a grand-daughter to their children, Leba and Gabi Klayman. This week's Shaleh Shudos is being sponsored this week anonymously as a gift to the Shul. We are proud to announce that this Year, our Annual Dinner will take place Sunday, May 5th at L'Chaim Manor. Our honorees are Moishe Meisner, the Shul's Financial Secretary and Marcia Fastag, who puts together the Shul's weekly bulletin.